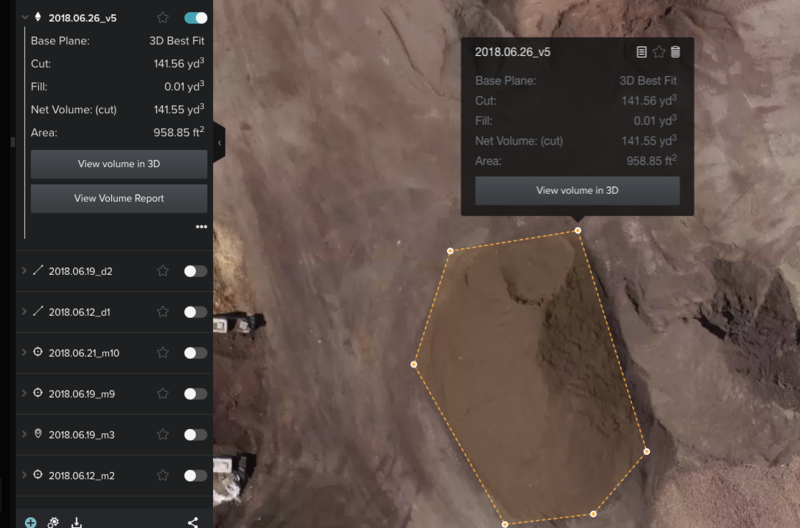 Measuring volumes with Site Scan Manager is designed for measuring stockpiles, trenches, and other voluminous areas. There are three base planes available that account for the underlying terrain: lowest point, highest point, and best fit. The lowest point base plane finds the lowest elevation within your selected area, and creates the base plane from that point. This is best suited for stockpiles on a flat surface—or with walls or other stockpiles nearby—that you plan to cut. The highest point plane will work from the highest point in your selected area, and is great in cases where you plan to fill, like a trench, hole, or ditch. The best-fit base plane, which is the default plane in Site Scan, is the most robust of the three: it will automatically determine the most appropriate fit for your selected area. Select the Volume tool from the Measure menu on the top of the screen. The Volume tool will also measure the area of the drawing. After selecting the polygon tool, click on the map to set the first point. Continue selecting points around the area you want to measure. To close the shape press ENTER or RETURN key or double-click the last point you created. 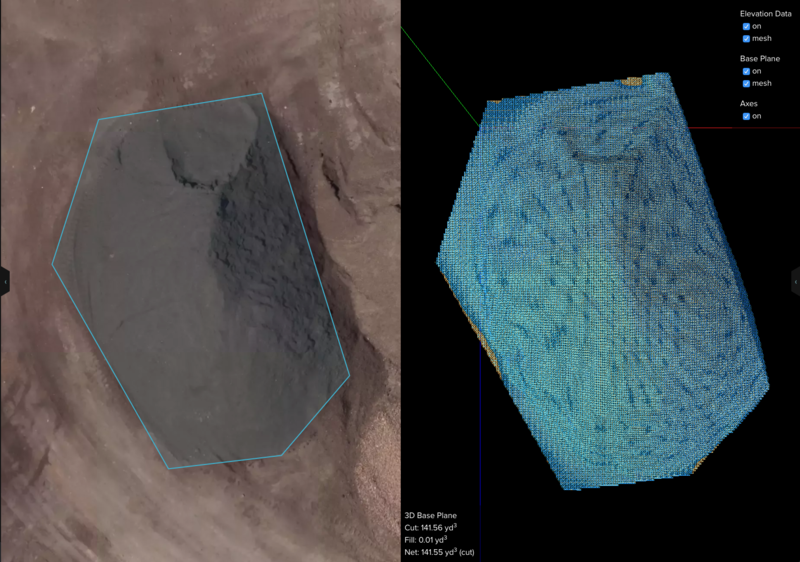 Once the area is delimited, click on the polygon created and the measurements will come up. By default, the measurement displayed is the best-fit base plane. When the net volume displays fill, it means the tool is detecting a negative volume (or the absence of material) which indicate it is a trench. 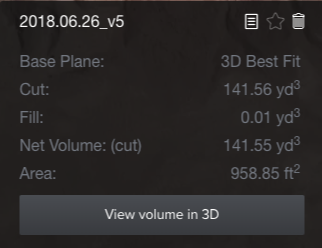 You can now click on View Volume in 3D and access to the Mesh Viewer for a better understanding of how is being measured. You can still edit the area that was selected and observe the changes in the mesh viewer on the right side. Change the underlying terrain using the drop-down menu on the top-right side of the screen and get different measurements according to variations on the base. Lowest Elevation Plane: Will create a flat base based on the lowest of the points used to draw the polygon. Highest Elevation Plane: Will create a flat base based on the highest of the points used to draw the polygon. Level Base Plane: Will allow you to define a custom flat base out of a specific altitude above mean sea level. By default, it will always go to the lowest of the points selected, but you can modify by changing the value of the Elevation. For more information, contact your Success Services Engineer.